Burgundy, John the Fearless (Jean sans Peur), Duke of Burgundy (1404-1419), silver grand blanc. Obverse: Shield bearing the arms of Burgundy. 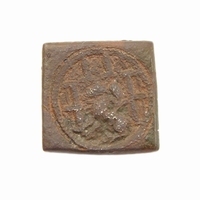 Reverse: Cross with one lion in the 1st and 4th quarter, and one lis in the 2nd and 3rd quarter. John the Fearless (sans Peur), also John II, was Duke of Burgundy from 1404 to 1419. He fought against the Turks at Nicopolis in 1396 where he distinguished himself on the battlefield and earned his nickname 'the Fearless'. He was a member of the Valois Dynasty and Regent for his cousin Charles VI of France who was mentally ill. There was a power struggle with the King's younger brother Louis of Orléans to gain guardianship and control over the Dauphin. This struggle culminated to the brutal assassination of Louis in the streets of Paris in 1407. On 10 September 1419 John had a meeting with the Dauphin (the future Charles VII of France) to discuss a peace treaty. The meeting rook place on the bridge at Montereau where John was assassinated by the Dauphin's companions. John the Fearless introduced two silver coins during his reign: the 'cromstaert' and the 'braspenning'.